“We used to cringe when a customer required really flat parts,” says Joe Arceneaux, manufacturing engineering manager at the Greensboro, NC plant of O’Neal Manufacturing Services (OMS). 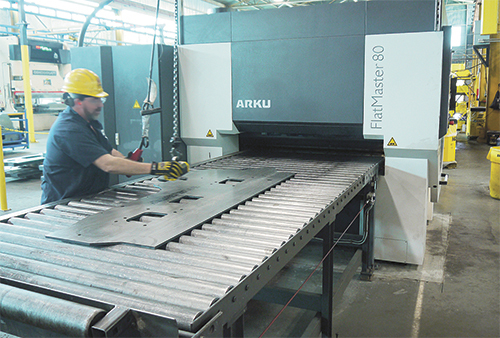 Specifically, Arceneaux describes a recent contract requiring flat parts (3 by 7 ft.) laser-cut from 10-mm high-strength low-alloy steel (65-ksi minimum yield), with an 0.07-in. flatness tolerance over the entire length. Using a gantry flattening press when prototyping the job, it took the plant an unacceptable 15 to 60 min. to flatten each part, often requiring hits from both sides. To the rescue came an Arku (Cincinnati, OH) FlatMaster 88 parts leveler, delivered early in 2013. The FlatMaster uses servo-hydraulics to set and maintain the leveling gap, and adjust forces to compensate for parts with cutouts, perforations or odd shapes. It can process parts from 2 to 23 mm thick, to 2 m wide.